In the late 70s and early 80s, my husband Mike and I traveled in Asia and Europe with the Gospel group Living Sound; I as the journalist, Mike first as the trombone player, then as European Director (while we lived in England.) 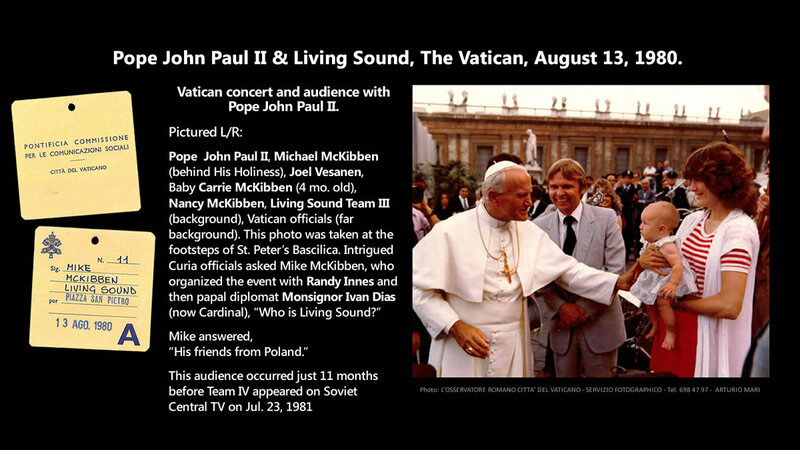 Despite the Iron Curtain that divided Eastern Europe from the rest of the world, Living Sound was able sing in Eastern European countries including Poland, working with Cardinal Karol Woytyla who would become Pope John Paul II, and the Soviet Union, at a time when few other Western groups played there. Here is a video produced by my husband Mike about that amazing time. 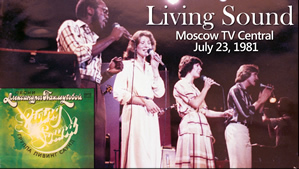 THE STORY: Michael McKibben, former European Director of Living Sound between 1977-82, assisted by numerous fellow Living Sound alumni, documents previously unreported musical events in Moscow, U.S.S.R. between 1979-81. 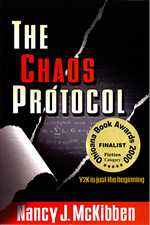 This story journeys back 33 years to a time of explosive tension between the U.S.A. and U.S.S.R, namely the Iranian hostage crisis, the Soviet invasion of Afghanistan and the U.S. boycott of the 1980 Moscow Summer Olympics. 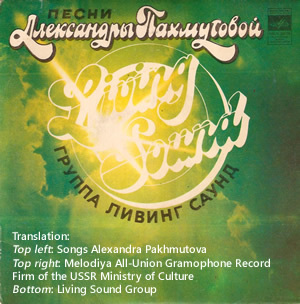 The songs “We Can’t Live Without Each Other” and “Childhood Dreams” by Soviet composer, Alexandra Pakhmutova (awarded the Order of Lenin in 1979) with English lyrics by Nancy McKibben, are the fruit of this unlikely East-West collaboration. This video also features “Then and Now” descriptions of the activities of principals in this story since 1981. THE MUSIC: “We Can’t Live Without Each Other” (“Hам не жить друг без друга”) by A. Pakhmutova, N. Dobronravov, English lyrics by Nancy McKibben, arranged and recorded by Living Sound in 1980, distributed by Melodiya, Gosconcert and Mosfilm in 1981, performed at Soviet Central TV on July 23, 1981 produced by Evgeny Ginzberg. THE VIDEO scripted by Michael McKibben with research assistance from Living Sound alumni. A special “thank you” to Stormie Baker, daughter of former Living Sound Team IV trumpeter Steve Baker, for prodding Living Sound alumni and friends to finally tell this story. 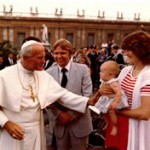 THE PEOPLE: Click here to view a list of the more than 200 people and organizations acknowledged in this video history. I also wrote English lyrics for a third song named “Olympiada ’80” by David Tukmanov. Enjoy! “Olympiada ’80” by David Tukmanov, English lyrics by Nancy McKibben; arranged and recorded by Living Sound. Melodiya Records, 1980. 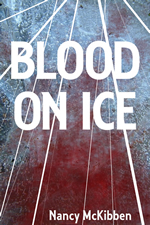 Accessed Feb. 11, 2013 <http://www.nancymckibben.com/blog/wp-content/uploads/2013/02/Olympiada-80-Living-Sound-Tukhmanov-McKibben-1980.mp3>. NOTICE: This material is made available under the “fair use” doctrine which allows copyrighted material to be available for educational purposes only. No intellectual property rights are waived and no rights of third parties are claimed. http://www.nancymckibben.com. 8 Responses to "Living Sound"
I grew up in my teens discovering living sound for the first time in Bethsan tabernacle Manchester England. The group and ministry had a big part of my future Christian development and ministry. I do remember seeing you then. I still have my old tapes and I also heard Terry law preach on a number of occasions. As write this I am listening to my old tape of ‘The great praise meeting’. I remember Bethshan well! You were great supporters of our ministry. (In 1975 and 1976, I played trombone.) You mentioned that you are involved in ministry. What exactly? Nancy and I visited the UK briefly two years ago on a speaking trip to Estonia. It was so good to see so many “old(er)” friends. In Malmesbury, it was as if 30+ years had not gone by. It was a real joy to see everyone and learn, for example, that the Men’s Prayer Breakfast that Vicar John Wilson and I started at Little Ingleburn is still going strong all these years later, now in the Village of Lea itself (St. Giles). We were there on Harvest Sunday and one of our our dear friends, Keith Withers, delivered the sermon. We’d love to get over for an extended time to visit friends around the country. Look forward to learning more about your life’s exploits. I have many fond memories of the visits Living Sound made to a small church in Hearthill Scotland. There were a few different groups but the music blessed us so much and inspired us as God called us to minister in music also. I stumbled on this site as I was talking to my wife about a particular song. The words were exactly John chapter 1 I tried to find it and found some good Living Sound songs on YouTube I remembered but alas not that one. Where can I buy MP3 downloads of the Living Sound songs? I apologize for the late response. MP3 downloads would be a good idea, but there aren’t any at this time. Possibly you could try looking for old LPs and CDs on Ebay? You told very amazing story about music and friendship! I would remind that this is was when USSR was main “Evil empire” for the West. It is still so, but already without so beautiful music contributions on state level. Someone can tell that it was soviet propaganda in music and it will right just partly. Your russian friends – and composer, and singer, and reporter, editor of “Melodia” – worked in cultural sphere and were part of big state system. After 1991 everyone of them become a free and work separatelly each of other. To make something new in this way already impossible. Sadly, but today’s private producers are not interested in similar musical friendship as in past. I am looking for a collection of Living Sound music online, especially in video (audio will do also, if possible). In particular: “Fill My Cup.” That song so blessed me that, when I got married in 1980, we used that song as the processional for the bridesmaids and my bride. Do you still have that song in your collection? It would sure be good to hear it again. Also, do you remember Robert & Scarlett McNeil? They used to be a part of Living Sound around the same time as you were there. Thank you for your time and devotion to the history of the group. I knew Terry Law in those days as well. Looking forward to hearing from you. Blessings. Thanks for your comments and for sharing the story about your wedding music. It would be a good idea to have Living Sound available online, but as far as I know, it isn’t. Sorry! If I hear otherwise, I will let you know. Yes, I do remember the McNeils, although we didn’t tour with them. My husband Mike has done most of the work of keeping the LS history alive – I just have a few blog posts. (I assume you’ve seen his YouTube video that was referenced on the Living Sound section of this web site.) It was quite a time!